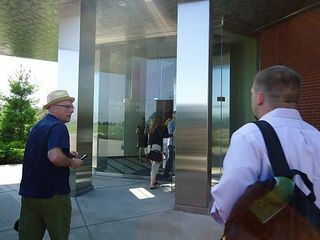 Home > DIY Design Inspiration > Recipes > GE – Imagination at Work in Louisville, Kentucky! 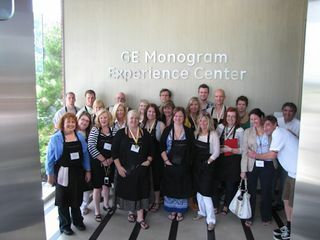 I’d like to give a BIG thank you to GE Monogram Experience Center for all that you do for appliance technology! I always knew GE was a leader in all things technology but what exactly does that mean? 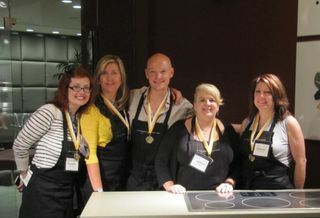 GE Monogram recently invited me, along with The Dream Team, (a group of Architect/Designer bloggers) out to their Monogram Experience Center in Louisville, where we viewed the latest in appliance technology. Having arrived as a guest of GE, we were treated in ROYAL fashion and stayed at 21c Museum Hotel, located in downtown Louisville. 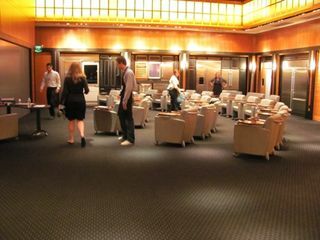 This Museum Hotel features exhibits from contemporary 21st-century artists which are displayed throughout all of the public spaces within the hotel. A hotel that’s a museum… a museum that’s a hotel…what a novel idea! Take this subject matter…loving it! 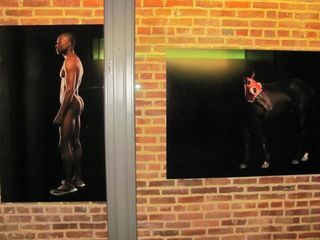 I had to stop at each floor to take in the photography that was waiting for me when the elevator doors opened. 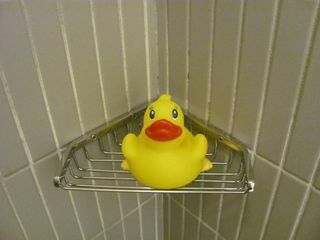 When I finally made it to my room, I met my roomy, a little rubber duck, a gift from the hotel….CUTE! At the meet and greet party, I was extremely excited to see The Dream Team! We spent some time catching up from our last time together at the Brizzo event in New York City. My yogis in the group are Jonathan Legate, Sean Culman and Tamara Stephenson, author of Nest by Tamara…a fabulous NY design blog. We made plans to do yoga the next morning and quickly discovered the perfect place to lay our mats, the black light exhibit. 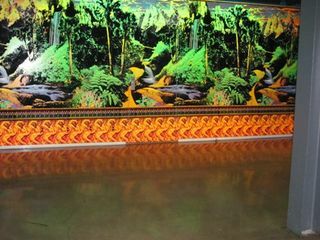 Can you pick out the magic mushrooms in the mural? This officially became our yoga studio for the week…NAMASTE yogis! 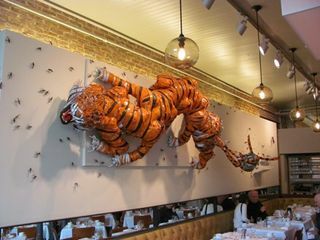 Even the restaurant exploded with wall art and seemingly, papers blowing in the wind. This bronzed DEVIL stole my heart in the downstairs bar. Needless to say, I was digging 21c Museum Hotel. 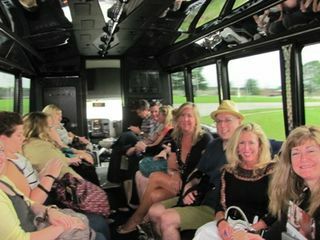 The next day GE whisked us off in the party bus where we we headed to The GE Monogram Experience Center. A state-of-the-art facility set up to perform hands-on training with some of the finest appliances in the world. The classroom was equipped with ergonomically designed chairs for comfort while learning about their products. 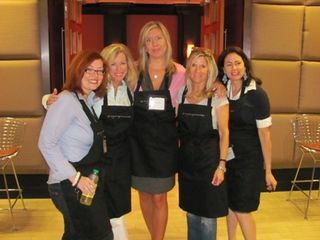 GE also supplied us with our very own aprons for the hands-on training, along with their very talented chefs. 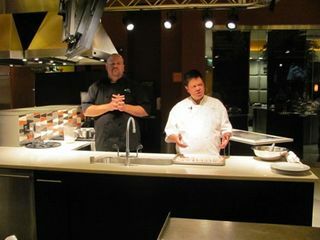 Chef Brian Logsdon and Chef Joe Castro. 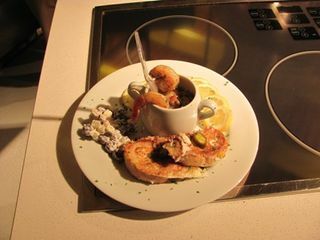 GE’s very own world famous chefs made it look so easy. We pretended to be like them as we prepared our own breakfast. 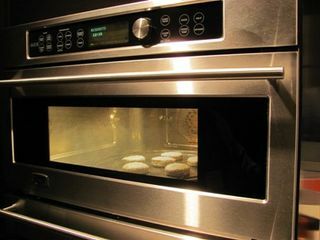 The GE Profile Advantium 240 Oven, the original speedcook oven, uses powerful halogen lights with a microwave boost to cook oven–quality food in an average of up to eight times faster than a conventional oven. By harnessing the power of light and adding a microwave boost, Advantium cooks the outside of food much like conventional radiant heat, but it also penetrates the surface so the inside cooks simultaneously. These biscuits came out perfectly prepared with this cutting edge technology…and in record time. 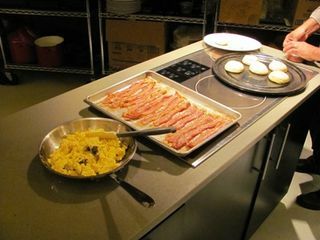 The real fun came when we were given a challenge in The Iron Chef Breakfast competition. We were divided up into teams and told to come up with our own menu from the ingredients that were laid out by the chefs. We were to prepare this meal AND clean up in only 50 minutes. 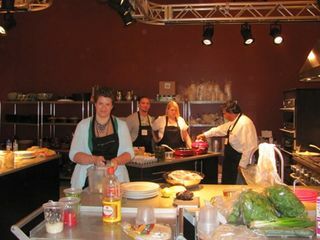 I was fortunate to have my teammates, who were very knowledgeable in food prep and I have to say that we pulled it off! 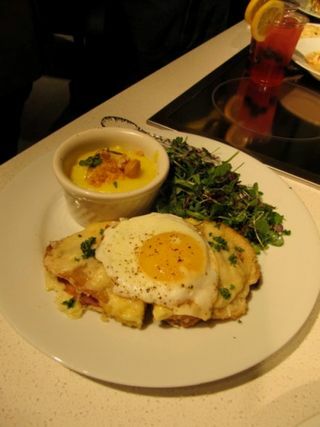 We chose to prepare shrimp & grits, ciabata eggs in the hole and a fruit salad…YUMMY! Even though we fought a good fight, we were not the winners. Thank you again to GE Monogram for a fabulous time in Louisville! In an upcoming post, I will be writing all about the latest products recently added to the GE Monogram product line, so stay tuned to Dig This Design for the latest! Check out this cocktail that I was served at 21c Hotel. I found the recipe on Spirit Drinks.com, a blog loaded with good fun! 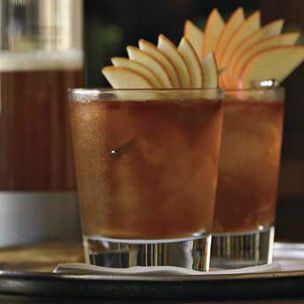 A Taste of Honey Cocktail is made from Bourbon, lemon juice and honey, and served in a cocktail glass. Shake all the bourbon, fresh lemon juice and honey with ice. Slightly wet the rim of a cocktail glass and dip it into sugar. Strain into the cocktail glass without disturbing the sugar. 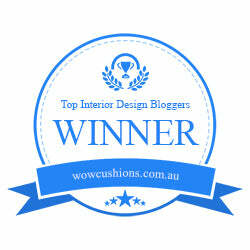 So glad I inspired you! Good luck and thanks for following Dig This Design.